Being a football fan means having to battle all weathers to support your team. Don't let your team down because you aren't prepared for rain or winds. Coming in either black or navy, our range of thermal training wear will keep you warm and dry so you can focus on the game. Our Vulcan Thermal Jackets are a heavyweight jacket with a quilted lining that will offer comfort and warmth. 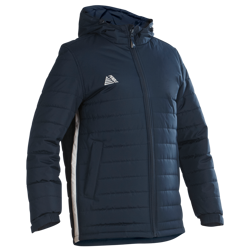 With a built-in hood and full zip, it is both showerproof and windproof to allow you to worry less about the weather and more about your team. Complete your outfit with our Titan Thermal Subsuit bottoms that also offer a quilted lining to guard you against the cold. They are comfortable to wear, top quality, and an unbeatable price. Never worry about being caught out by the weather again and complete your training wear by checking out our thermal range now.